Say the word “yarn” and most people think of lambswool, cashmere, cotton, maybe even ~ gasp ~ synthetics. Yarn can be made from virtually any fiber that can be spun, including plant fibers. Here are some of the unusual knitting yarns you’ll find at Ewe & Company. Because these yarns are so unique, they will go quickly. 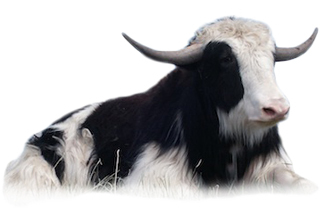 Yak ~ Related to domestic cows, the yak produces two kinds of fiber: the coarser “guard” hairs of the tail and skirt, which are used for ropes and rugs, and the “down” hairs, prized for knitting yarns for their warmth, softness and durability. Bijou Basin Ranch grows their own yak herd and harvests fiber every year. Possum ~ Not the roadkill sort so often seen in this country — this is yarn spun from the furry but habitat-destroying marsupial overwhelming New Zealand. Yarn from this possum is warmer than lambswool or cashmere, is incredibly soft and luxurious. Read about the attributes of possum yarn at Zealana. Buffalo ~ The American bison was hunted almost to extinction, but a few dedicated ranchers have worked steadily to preserve the breed. The down from buffalo is rare but makes a wonderfully soft, warm yarn. And we have some from Buffalo Gold Lux…lace-weight and hand-dyed. Soy, Milk and Corn ~ Kollage Yarns, inventors of the square knitting needle, make some of the most unique ~ and renewable ~ yarns anywhere. Soy yarn may sound odd, but it’s not much different than making yarn from cotton and linen fibers; soy fabric used to be quite common. Milk yarn is made by removing the water from milk and using the remaining protein in a wet-spinning process. With corn, the starch (not the silk) is extracted in sugar form, fermented, and separated into delicate fibers that can be cut, carded, combed and spun into yarn. How cool is that! If you’d like to have more detailed information on how these unusual yarns are made, let us know by commenting here. Or, you could just come pick up some at the shop and start knitting. You’ll be amazed at what you can do. Thinking about taking a knitting class? We have them, including a beginner’s class to get you started. This entry was posted in Kingston Springs, yarn, yarn shop and tagged corn yarn, Ewe and Company, exotic yarn, hand-painted yarn, Kingston Springs, knit shop, knitting, milk yarn, possum yarn, soy yarn, yak yarn, yarn, yarn shop. Bookmark the permalink.